In a blender, add all ingredients together. Blend until all ingredients are mixed and smooth. Split smoothie into 4 glasses. Serve with one slice of toasted whole wheat bread or whole wheat English muffin. This is pretty, refreshing, easy on the heart and tummy. 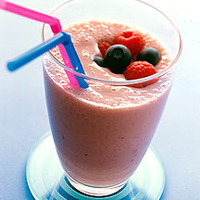 I think, for some people this smoothie could easily serve as a meal. I'm LEARNING to appreciate the soy milk and tofu products. This is a nice recipe. What pretty and delicious smoothie!! Very healthy and refreshing!